Over the past few weeks I have been working with the Make Poverty History campaign head office in Ottawa. Initiated with Catapult Media, I have helped to set up this blog in the fight against poverty, both locally and globally. Built in Drupal with the very least of bells and whistles, the blog is a sort of interim blog until the re-launch of the new site, being designed and built by Vancouver firm, Communicopia, and is set to launch in the next month or so. We have recruited 8 bloggers from across the country, along with a celebrity blogger in Kenya, who will be contributing to the blog to spread the word, gather some eyeballs, educate, inspire, motivate and challenge us all to help Make Poverty History. Check out and join the Facebook group as well (there are a ton out there, but this is the “official” one!). We are hoping to gain force and awareness in building toward October 17th for Stand Up and Speak Out. Read this blog (even though it’s not in your feeds just yet! ), spread these outlets into your communities, and contact the MPH team via the Contact Page on the blog with your thoughts and comments. All postings and comments will transfer to the new site this fall. 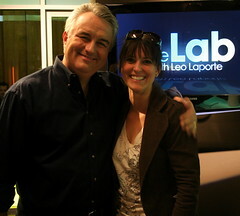 I had a blast hanging out with Leo and the Lab’s gang about a month ago: great people, comfortable set, fun content! If you’re in Vancouver and have all kinds of techy-talk you’d like to share with Leo, contact the show and let them know you’re interested. Matt Harris, The Lab’s Producer (and as we discovered before shooting, a fellow Rye High RTA Grad – small world!) is always looking for more people (and advertisers) to have on the show. Warwick and I took a bunch of pics that day as well – check ’em out. I love ReadWriteWeb. And Facebook I quite enjoy. I’d be a fool not to. This week, one of my favourite techy resources is sharing all that is Facebook: the good, the bad and the ugly in what they are calling Facebook Week. So if you’ve been hard-pressed to just keep up with this mainstream social network and its’ rapid evolution to stardom, follow along with MacManus and his team of writers this week you will very likely get all you need to know (and more) on what is perhaps the most fascinating web company of 2007. I have finally found an acupuncture and wellness centre in Vancouver to heal me! I have had many body ailments and injuries over the past 20 years, mostly rips, tears and fractures from playing all kinds of sports, landing a few snowboarding concussions, but also from being quite accident prone in general – who else tears out their entire shoulder from slipping and tumbling down a snowy, wet escalator in the Montreal Metro? I have visited somewhere between 5 and 10 different physiotherapists in 4 cities across Canada over the last decade, all of them have helped me tremendously, and all have lent a hand in fixing whatever needed fixing. But I am not quite 100% on most injuries. The trick (for me) with physical injuries to the body: consistency and diligence – you’d think it’d be easy to do those stretches and exercises twice a day to improve your strength. It’s not. If things are mostly working, I think I am good to go. How stubborn. But I have found a place and a practitioner that has given me the knowledge, motivation and positive mental boost to be diligent. I am receiving treatment for a pretty minor injury at the moment, but it is one that has inhibited me to do very much of anything on my feet for the past 3 months, essentially stopping me from most things I like, running being number one on the list. Arg. Glow Acupuncture and Wellness Centre is a lovely space to spend some time. Located in downtown Vancouver, in the heart of Yaletown, this peaceful, airy, 4th floor centre is a treat. The floors are covered in beautiful, old hardwood, the windows are large with Vancouver city views, allowing for plenty of light, each treatment room makes you want to run home and redecorate your own bedroom to be just as calming and fresh as these rooms, and the walls are dotted with simplistic, wonderful original artwork and photography that leaves you feeling inspired. Of course there are the token rock and waterfall sculptures for a little added serenity. And you’re always greeted with a lovely, pleasant, smiling face! My acupuncturist, one of the founders and owners of Glow is excellent: thorough, professional, highly trained, extremely knowledgeable, helpful, sincere, and most of all, compassionate about my pain and passionate about bringing me back to 100%. Glow offers a wide array of services, from deep tissue massage, to acupuncture, yoga, detoxification, even helping you to quit smoking if need be! I would recommend this wellness centre to anyone in a heartbeat, for anything at all where your body and mind is concerned. One of my best friends just had a healthy baby girl a few weeks ago, her first child. Getting pregnant was one challenge, but having a healthy, uneventful pregnancy, in labour for a quick 6 hours, and 7 fast minutes of actual pushing, WITH, I may add, a baby that SLEEPS ALL THROUGH THE NIGHT, she is truly blessed and attributes all of this good fortune to consistent acupuncture throughout. Glow is the place to seek out for caring for yourself and your body. Get in touch with them here. Or if you would like to ask me more questions about my experience, comment here or contact me. It took me a day to really get over the effect of K’naan; the energy and peace that spilled all over me from a mere 20 minute conversation with this man – he is a special human and his essence reeks of a positive peace that I have not experienced too often in my short life. ThisCityRocks features K’naan in Episode 11 from the Telus Ski and Snowboard Festival in Whistler. Sol Guy from Direct Current Media was kind enough to grant us some time for an interview. And Warwick and I melted from K’naan’s inspiring live show in the village. I took a few snaps of the show as well. Thank-you to Art Maughan from BoxTop Studios for stepping in to edit this episode. A lot of fun stuff produced in this one. And to Class5 Snowboards for sponsoring the episode.